UAE foreign minister Abdullah bin Zayed, his Qatari counterpart Khalid Al-Attiyah, and US Deputy Secretary of State William Burns were scheduled to visit the Muslim Brotherhood's second-man Khairat El-Shatar in Tora Prison on Sunday night, government sources told Ahram Online. The trilateral delegation had aimed to present the Islamist leader with an initiative to at break the political deadlock and circle of violence that engulfed the country since the ouster of former president Mohamed Morsi. However, El-Shater, who has been detained on charges of inciting to kill protesters since 6 July, has refused to meet with the US, UAE, and Qatari officials to discuss the deal, Al Jazeera TV reported. "Mohamed Morsi is the legitimate president of Egypt. They should go talk to Morsi," declared El-Shater according to the Qatari based network. Meanwhile, Egypt's interior ministry said late on Sunday that no delegation from the United States or the European Union visited El-Shater in prison. Ahram Online has learned that the trio's deal calls for the replacement of Prime Minister Hazem El-Beblawi, who Morsi supporters harshly criticise and accuse of bias, with a premier that is viewed as more independent and objective. However, no specific figure was offered as El-Beblawi's potential successor. The deal also proposes the formation of a new cabinet, which would include three ministers from the Muslim Brotherhood in addition to two Salafist ministers. The incumbent government does not include any Islamist figures, as the Brotherhood and other Islamist forces have refused participation in protest of Morsi's ouster. Furthermore, the deal entails a Brotherhood-orchestrated dispersal of the pro-Morsi sit-ins held in Cairo. Tens of thousands of Morsi loyalists are maintaining three sit-ins; one near Nasr City's Rabaa Al-Adawiya Mosque, a second in Giza's Nahda Square, and a third in Heliopolis' Alf Maskan area. The trio proposes that the 2012 constitution, which was frozen as part of the armed forces' political roadmap, be amended as planned, with Islamists included in the 50-man committee tasked with drafting the amendments. Islamist figures would also participate in drafting the law regulating the upcoming parliamentary elections. Should the deal be accepted by all sides, the Muslim Brotherhood, founded in 1928, would not be disbanded. The law regulating political parties would not exclude religious parties, such as the Brotherhood's Freedom and Justice Party or the Salafist Nour Party. The deal guarantees that charges leveled against a number of Islamist figures "will not be politicised," and be subject instead to independent investigation by the judiciary. Last week, a top Egyptian court ordered Morsi's detention for 15 days pending investigations into his suspected collaboration with the Palestinian Islamist group Hamas, an ideological offshoot of the Brotherhood. Morsi has been held incommunicado ever since his overthrow on 3 July, which was part of the armed forces' plan for Egypt following nationwide mass protests against the former elected president. Ahram Online has learned that the proposal was discussed with Egypt's interim Vice President for foreign affairs Mohamed ElBaradei and is negotiable. The UAE and US officials have rescheduled their itinerary in order to leave on Monday, extending their stay by one day. The Qatari minister, who was also scheduled to leave on Sunday, has yet to set a date for his departure. Qatar has been a strong backer of Morsi's Muslim Brotherhood, granting Egypt some $7 billion in aid during his year in power. Conversely, the UAE, along with Saudi Arabia and Kuwait, have welcomed the army's ouster of Morsi. Western and Arab states, unsettled by the deepening turmoil in the Arab world's most populous state, have been working to mediate between Egypt's interim administration and allies of the toppled president. Burns, along with European Union envoy Bernadino Leon, met with army chief Abdel Fattah El-Sisi on Sunday, according to an army statement that did not comment further. 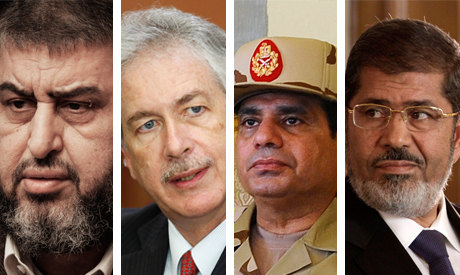 The representatives sat earlier with government officials and Morsi allies. US President Barack Obama has also asked two senators to travel to Egypt "soon" to hold talks with the interim government and the opposition. In a meeting with US and EU envoys on Saturday, a spokesman from a pro-Morsi delegation said they are open to solutions but expressed rejection of any involvement of El-Sisi in a potential agreement. Morsi's supporters also demanded the restoration of the 2012 constitution. Tensions have been running high in Egypt amid calls for Morsi supporters to end their Cairo sit-ins and return to the political process. Morsi's camp has remained defiant in the face of government orders and interior ministry threats to disband. They should talk to President Morsi! Morsi never sent the police to beat and shoot the protesters. Morsi never threatened the Protesters with a crackdown. If you want to see how terrorism works, then look at your own coup made one. Why did Burns et al go to see El Shater first? You think totally wrong. Egyptian Army fully depends on US. Saudi Arabia, UAE are just like US provinces, being US puppets. Without the permission of US, neither army could have done coup, nor Saudi and Emirate puppets could have made financial assistance to current authoritarian regime of Egypt..Eventually, US will manage to bring Muslim Brotherhood to power after framing it, all generals will be put in jail, similar to what took place in Turkey..Because, Muslim Brotherhood is the single power spreading not only in Egypt but in all regional countries.. Religion and politics - don't mix! "Should the deal be accepted by all sides, the Muslim Brotherhood, founded in 1928, would not be disbanded. The law regulating political parties would not exclude religious parties, such as the Brotherhood's Freedom and Justice Party or the Salafist Nour Party." It should be abundantly clear by now that politics and religion "don't mix". Politics is (or should be) about tangible order for a community by means of practical implementation of economic, social and educational steps. It is based on the idea that an office is given in mandate by the people who are the source and origin of power. As such, the politician or the party are also accountable to the voters, and not only those who voted for them, but voters in general. Now how can you hold accountable a group of people who take their mandate ultimately from some putative higher being and base their political decisions not on the above mentioned, but on some text or other that must never be analyzed, critized or even subjected to scientific research? Religion in politics make a mockery of accountability and free will! Hang the traitor alsisi and return Egypt to its people less the foreign agent elbaradei. These conditions and the presence of foreign negotiators are unacceptable. The Brotherhood were offered a seat at the table, begged to join, and refused. They chose to protest and incite violence. The Nour party has been devisive, but smarter. They moved to oust Morsi but then pulled back to ensure support among Brotherhood voters and their own base. Cynical, but so far effective. Qatar is a troublesome presence and should have no place at the table here. That the Muslim Brotherhood listens only to foreign powers is problematic in itself, and confirms that the Brotherhood was never about Egypt's interests, but its own. The Brotherhood cannot now dictate the makeup of the cabinet and next steps. Morsi is out and that will not change. The military and interim government are now under pressure from foreign powers to handle the Brotherhood with kid gloves. The interim authorities must stop bowing to foreign pressure and continue the course, legally and wisely. Now Senators Graham and McCain are en route to tell Egypt when to hold elections. What a debacle. Elections must be held when Egypt is ready for elections-- do not repeat the messes of 2011 and 2012.The intervention of foreigners is the reason why Egypt is in this perpetual mess in the first place. When will we learn? You'll learn when you come to accept that Islam is here and its base. when you respect yourself others will respect you. Baradei admitted its he who called USA blessing for a coup.